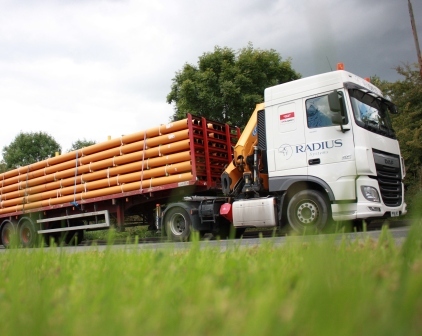 Radius Systems are extending their pipe delivery frequency from their Lurgan facilities to benefit all their customers in Ireland. Radius Systems already implements a scheduled full load pipe delivery service in Ireland from their Lurgan (Co Armagh) factory and this service is being extended from January 2018, to include a weekly groupage scheduled “Milk Run” service to cover the whole of Ireland. As part of their logistics improvement programme to achieve optimum customer service, Radius carried out stockyard expansion works to increase pipe storage capacity at their Lurgan facility, to support this new initiative and accommodate increased stocks of pipe produced at their two factories. The new weekly Milk Run is in addition to the standard three-day delivery service for full product loads shipped from Lurgan and four-day service for full pipe loads delivered from Derbyshire. The Milk Run will be scheduled to specific areas each day (see map for details), with free delivery for full loads and orders over €1,000. Orders outside the agreed limit and times may be subject to a delivery charge. Tom Berry, regional sales manager for Radius Systems explained: “We’ve been working hard to develop our logistics operations by putting in place more efficient systems to support this new scheduled pipe delivery service. This is great news for our customers in Ireland giving them a more comprehensive delivery service than is currently offered. With these processes in place, we are a stage further in developing and implementing smarter solutions to move our logistics function forward and generate increased customer confidence and satisfaction”. For more information on the new pipe delivery arrangements to Ireland, please contact your regional sales manager or our customer services team on: +44 (0)1773 811112.